Relational databases are pervasive in the enterprise. More, they come in all sorts of shapes and sizes in the same shop - from modest desktop DB's like Access / Excel to open source workhorses like PostgreSQL / MySQL to top-shelf like Oracle / MS-SQL / DB2 to old powerhouses like Informix. Wouldn't it be nice if you could have just one tool to interact with all of these databases: construct queries, view data, import / export data, perform administration, compare / move data between databases, etc.? 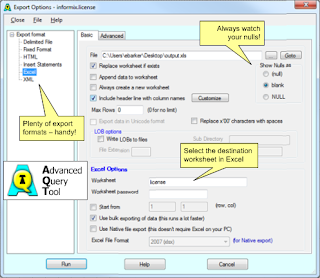 Advanced Query Tool (AQT) is that tool. Like the SQL Cookbook, AQT comes highly recommended by those same 'scary good' DB guys. I've found AQT to be especially valuable when working with: (1) old beasts that don't have nice interactive query tools, and (2) newer beasts that require access to the DB's installation media and heavyweight installs. Our team here uses AQT everyday for developing, testing, and supporting the State's production systems. Note: The inspiration for this post was from one of my colleagues. He used AQT to verify the recovery of image files into blob fields on an Informix database. You can imagine the command line wizardry this would require had he used the database's built-in tools. 5 Oct 2011 Update - AQT has come to our rescue again twice in the last couple of days. We used the data loader to recover about 14,000 records, and used the data compare to identify duplicate records between production and archive databases.